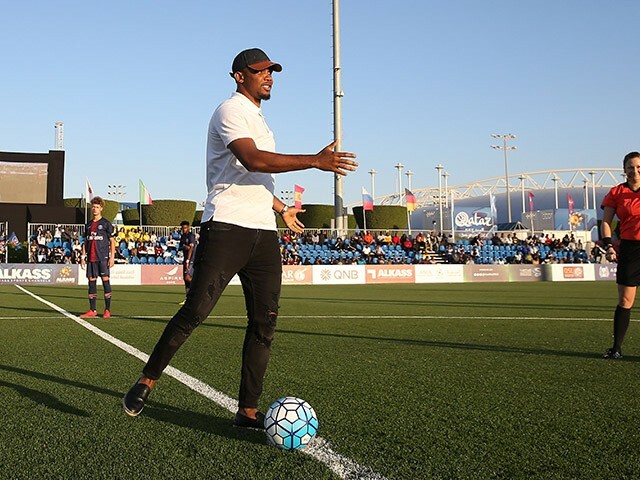 Kicked off by Barcelona and Cameroon legend Samuel Eto’o, the opening day of the 2019 Al Kass International Cup took place amidst a carnival atmosphere, following Qatar’s heroic triumph in the AFC Asian Cup. The eighth edition of the world-class youth tournament is once again showcasing some of the world’s most talented young players before an enraptured audience in Doha. The event was attended by various Qatari dignitaries, including H.E. Sheikh Hamad bin Khalifa bin Ahmed Al Thani, President of Qatar Football Association; H.E. Hassan Abdullah Al-Thawadi, Secretary General of the Supreme Committee for Delivery & Legacy; Mr. Essa Bin Abdullah Al-Hitmi, General Manager of Alkass Sports Channels; Mohamed Khalifa Al-Suwaidi, President of Aspire Zone Foundation; Jassim Al Buainain, Secretary General of Qatar Olympic Committee; Nasser Al Khater, Assistant Secretary General of the Supreme Committee for Delivery & Legacy; Mansoor Al Ansari, General Secretary of Qatar Football Association and Hani Ballan, CEO of Qatar Stars League. Qatar; Pasquale Salzano, Italian Ambassador to Qatar; Belen Alfaro, Spanish Ambassador to Qatar; Seiichi Otsuka, Italian Ambassador to Qatar; and Mr. Pierluigi Collina, FIFA’s referees committee Chairman. In a festive atmosphere, 2018 cup winners Paris Saint-Germain drew 1-1 against last year’s runners up, Kashiwa Reysol, in a game that caught fire late on. In the second match, Morocco’s Raja Casablanca narrowly prevailed by a single goal over Aspire Academy. “Al Kass brings Morocco back to us, so we come to support our team all the way to the cup.” Walid and Issam, Raja Casablanca supporters. of the players that won the Asian Cup last week. Maybe we’re seeing tomorrow’s world champions playing here today.” Abdulrahman, Qatari football enthusiast. “After what happened last week with the Qatari national team, I want to see football every day.” Mohammed, Aspire Academy supporter. “Al Kass is a rare opportunity to see future football stars play up close. I come here every year, and it has been more than once that we’ve seen one of the players in their clubs’ senior teams thereafter. Also, I want to see PSG win again.” Thierry, Paris St. Germain supporter. Janice, Australian football enthusiast and Kashiwa Reysol supporter.